The Secret Diary of Steve Jobs : Oh. My. God. This is how the Borg does marketing. 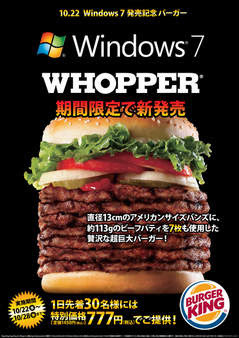 A seven-burger Whopper promo at Burger King in Japan. Much love to the many readers who have alerted us to this. But is this for real? Even the Borg couldn’t be that bad at marketing, could they? On the other hand, it’s kinda sorta poetically perfect isn’t it? I mean as a visual image of what Windows is — a big giant pile of grease and fat, served up cheap.